A man was shot dead by police during an operation relating to a suspected plot to free a prisoner. Erun Izzet, 32, and Erwin Amoyaw-Gyamfi, 29, were being transported in a custody van to Wood Green Crown Court for sentencing in the morning. 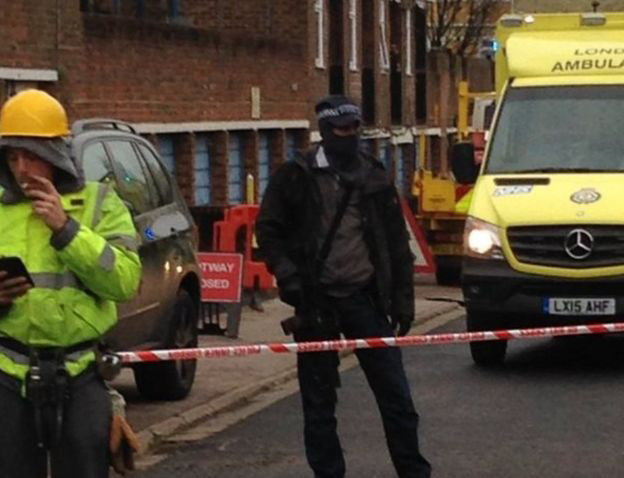 Officers shot dead a 28-year-old man close to the back entrance of the court building at about 09:00 GMT. Two people were arrested near Bracknell Close on suspicion of conspiring to help someone escape from custody. Sentencing has gone ahead for Izzet and Amoyaw-Gyamfi, who previously pleaded guilty to an incident on 13 October 2015. They were accused of a range of offences including possession of a sub-machine gun, self loading pistol and bullets with the intent to endanger life. They were jailed for 14 years each. As he sentenced them, the judge said he was ignoring the serious incident outside court earlier and had granted the particular wish of the two men to be sentenced today. The Met said the operation in Wood Green was "intelligence-led" and had resulted in the arrests of four people in total. 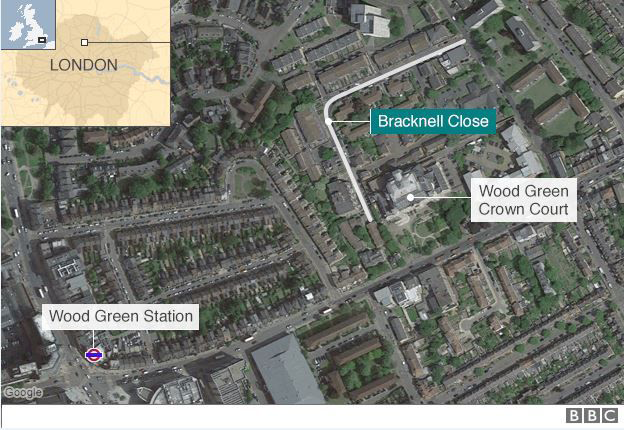 The two arrested near Bracknell Close were aged 30 and 19. In nearby Barratt Avenue, police also arrested a 31-year-old and a 25-year-old. The Met said these were "related" arrests but did not specify the nature. Following the shooting, police cordoned off the road at the junction of Bracknell Close and Olympus Grove, near Winkfield Road. 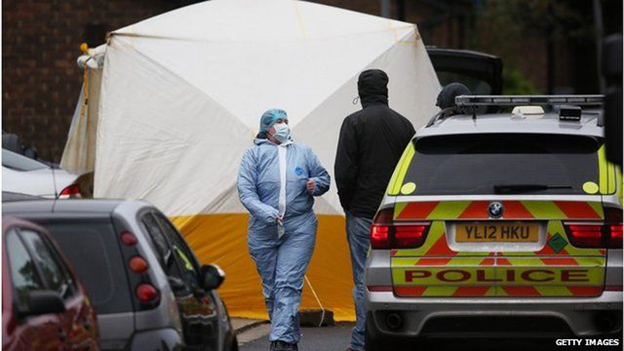 A white forensics tent was erected in the residential street and officers wearing balaclavas were at the scene. 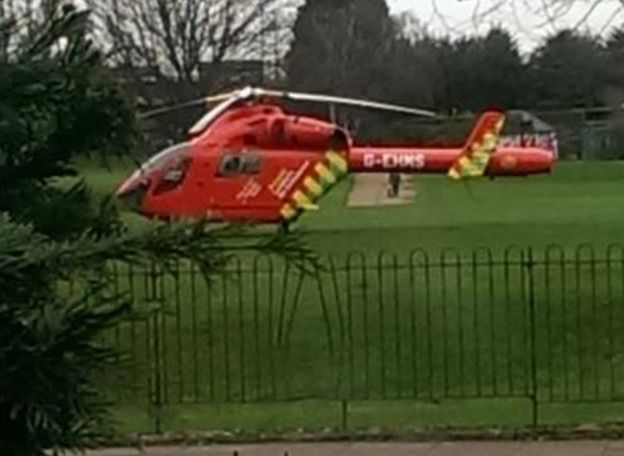 An air ambulance was also called but the man was confirmed dead shortly before 10:30 GMT. Ashley Howard said he was working on scaffolding and saw the air ambulance arrive. He said: "Next minute I see armed police and a guy on the floor. "The air ambulance people tried to resuscitate him. They took him away in a body bag." 2015: James Fox was shot dead by police in Enfield; in October, Richard Davies was shot dead by police at St Neots in Cambridgeshire. Tenant Angie Buzzacott said it was a nice, quiet estate and she was trying to do as much as she could to "keep everyone calm". The Independent Police Complaints Commission said investigators were at the scene overseeing initial accounts given by the officers involved. The Met added the Directorate of Professional Standards - its internal investigator - had also been informed. Police confirmed the incident was not related to terrorism. A spokesman for the Ministry of Justice said: "Following discussions with the police, there is an increased security presence at Wood Green Crown Court today. The court continues to operate as normal." The spokesman said he could not comment further because of the ongoing police investigation.